A City of My Dreams and now My Reality. Night Time view from Hotel Balcony. Really France, The "Very Bad Trip 3"? We took that to mean the previous two had been called the same thing! For some reason I really loved this statue. I think it was it's thinking pose/stance. At the top of the Pantheon looking down. Eiffel Tower = Pure Madness. Second Level of Eiffel Tower. We went right up to the Summit, we thought why not whilst we are here. Finally at the bottom again. Our journey to the top and at the top of the Eiffel tower is a whole story in itself. But I'll word save by saying that a man tried to jump while we were at the very top and so the fire brigade were called along with the police, and every other imaginable emergency service. It took us an hour to get down because every security measure was being taken, and we had to be brave soldiers and walk half of the way back down. That was an experience just in itself let me tell you! Pont de l'Archeveche = "Love Lock Bridge"/ "Lover's Bridge". Trust me Google it. It was one of the most romantic things I had ever seen. I just wish I had spent more time walking across it. But let me tell you, it isn't for the faint hearted and the view definitely isn't always picturesque. As I was about to step onto the bridge, Alex kindly brought my attention to the rat (who was missing half of its tale by the way) scurrying its way to the other side in front of me. Now I'm not majorly screamish when it comes to rats, but I still wouldn't have appreciated it crawling across my feet! Sounds quite creepy when we say "we went to a cemetery" whilst we were there in Paris. 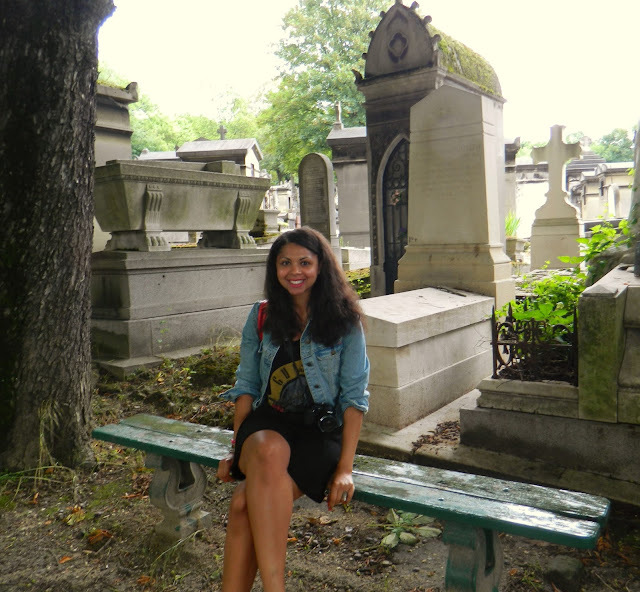 But let me explain... it came by recommendation of our travel agent lady, and it was the famous cemetery called "Pere Lachaise". This cemetery is beautiful first of all, but there are lots of influential and well known people buried there and it also has a lovely story behind its existence. So, if you ever go to Paris I recommend you visit there. Paris definitely need to lower their alcohol prices. I nearly fainted. Definitely didn't leave any! Looking back on all of the hundreds of photos me and Alex took that week in Paris, it makes me sad and longing, yet a sense of accomplishment overrides the previous emotions to conquer through. A year ago I could barely leave the house, and so for overcoming things I wouldn't have even dreamt about last year I am extremely proud of. And I am also extremely proud of being courageous enough to share it with you guys. Have you guys ever been to Paris? Anywhere in particular you want to go, or have plans to visit?